Hello all! 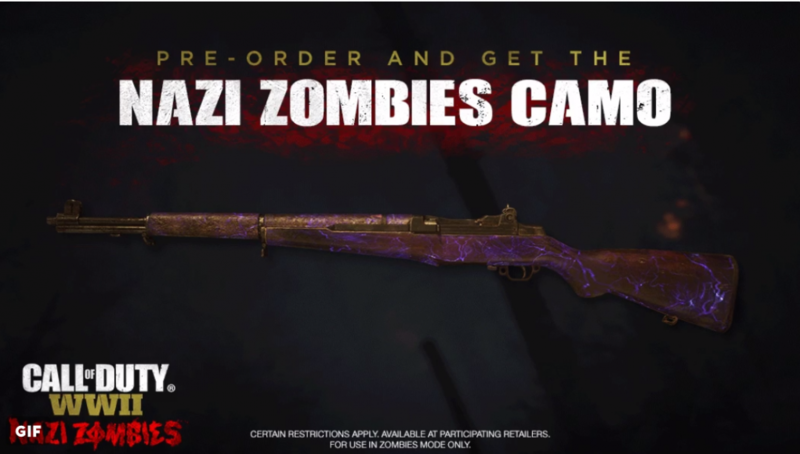 I was just browsing the forums and realised that no one had posted about one of the pre order bonuses for WWII that includes a sweet zombies mode camo for your weapons. At first, when the image was first released, SHG didn't actually say that the camo was ZM only at the time and this sparked up a lot of hate as many players didn't want the camo to be put into the MP or Campaign mode as it would ruin the look of the games WWII theme. But after a lot of 'not so nice' tweets, SHG then came out and said that the camo is for WWII Zombies only. With that being said, does this mean that weapon customization will be available in WWII Zombies? I think so now. Here is an image of the Pre Order Bonus Camo. What do you think of it? I am dying for Friday to come to play. I hope there are more camos in zombies to unlock via challenges than BO3 had.